The UT Graduate School of Medicine has initiated a new Bariatrics and Robotics Fellowship (BRF), considered the first of its kind, and will begin training its first fellow July 1. 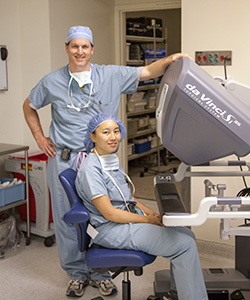 The program is offered within the Division of General Surgery in the Department of Surgery and has provisional accreditation from the Fellowship Council, which oversees 150 non-ACGME (Accreditation Council for Graduate Medical Education) fellowship programs related to minimally invasive surgery and other gastrointestinal surgical specialties. A site visit is expected within the next six months. This new fellowship program places the UT Graduate School of Medicine on the forefront of robotics fellowship training. Gregory Mancini, MD, Associate Professor of Surgery and BRF Director, said minimally invasive robotics is a growing field of medicine with several benefits. Namely, the tools used to perform the surgery can move in multiple directions, unlike traditional laparoscopic surgery, so physicians have better range of motion. Also, a camera projects the operation onto a screen that provides the physician with a three-dimensional view of the surgical area, so surgeons have better visualization throughout the procedure. Dr. Mancini specializes in bariatric surgery, which he said is a growing need in Tennessee for obesity treatment. He said creating a fellowship program in this specialty not only helps meet this need but also enhances research and general surgery residency training in this field. Dr. Mancini said the department chose to add the robotics component because The University of Tennessee Medical Center offers a Comprehensive Robotics program, and this aspect of the program keeps the Graduate School of Medicine on the cutting edge as an early adopter of advanced technology training. Hien Le, MD, will be the first fellow to enter the BRF program July 1, following graduation from the UTGSM General Surgery Residency. The fellowship is a one-year program that will include three months of bariatrics research, three months of simulated and hands-on robotics training, as well as three months in colon disease and robotics training and three months in gastroesophageal and robotics training. A new patent was issued by the U. S. Patent and Trademark Office to Jonathan Wall, PhD, and his collaborators for methods to treat patients with light chain amyloidosis using antibodies. A Phase I clinical trial is in progress at seven sites within the U.S., including Stanford University Cancer Center in Palo Alto, California ,and the Mayo Clinic in Rochester, Minnesota, to study dosing and organ response to the antibodies. Dr. Wall, Director of the Preclinical Diagnostic and Molecular Imaging Laboratory, has been working with Dale Schenk, PhD, and his industrial partners for 5 years, to test novel antibodies that destroy light chain amyloidosis. This form of amyloid is composed of sticky fibrils and sugar-like molecules that deposit in organs such as the heart, kidneys, and liver and lead to organ failure. 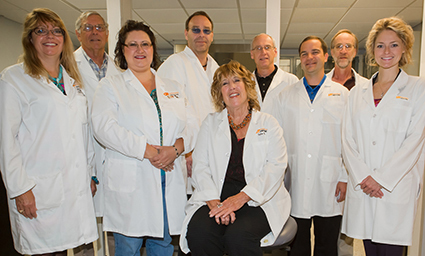 Schenk wanted to collaborate with Dr. Wall and his team, including Stephen Kennel, PhD, Alan Stuckey, Tina Richey, Sallie Macy, Craig Wooliver, Penney McWilliams-Koeppen, Emily Martin, Steve Foster, and Angela Williams, because of the unique resources available at the UT Graduate School of Medicine and for their expertise and experience with light chain amyloidosis, which although relatively rare, is a devastating disease that affects organs throughout the body. The idea behind the invention is that the body is incapable of producing antibodies that can recognize and destroy amyloid. The body does not “see” the amyloid as unnatural nor recognize that the clusters of protein pose a threat, so the body does not create antibodies to attack them. However, the research team was able to elicit a positive response using these new antibodies in an animal model of the human disease, which resulted in destruction of the amyloid. These same antibodies are now in human clinical trial. According to the Amyloidosis Foundation, incidence of amyloidosis is not as rare as it was initially considered. Approximately 3,000 people in the U.S. and Canada, 50,000 worldwide, will become afflicted by amyloidosis each year. The Amyloidosis Foundation considers amyloidosis as underdiagnosed and recently released a video to raise awareness about the disease. Dr. Wall has been studying the disease for 19 years and received multiple patents and grants for creating methods to image and treat the disease, which to date, remains incurable.